The Toyota Matrix combines cargo utility and fuel economy in a compact car that offers a choice of engines and all-wheel drive. Developed in tandem with the Corolla sedan, the Matrix is essentially the five-door hatchback wagon version of the Corolla. In fact, Toyota refers to it as the Toyota Corolla Matrix. Whatever you call it, the Matrix is a sensible choice for many people. It can carry four big people or drop three seats and slide a short board inside; four doors and a hatch make loading kids, dogs and miscellaneous cargo a cinch. 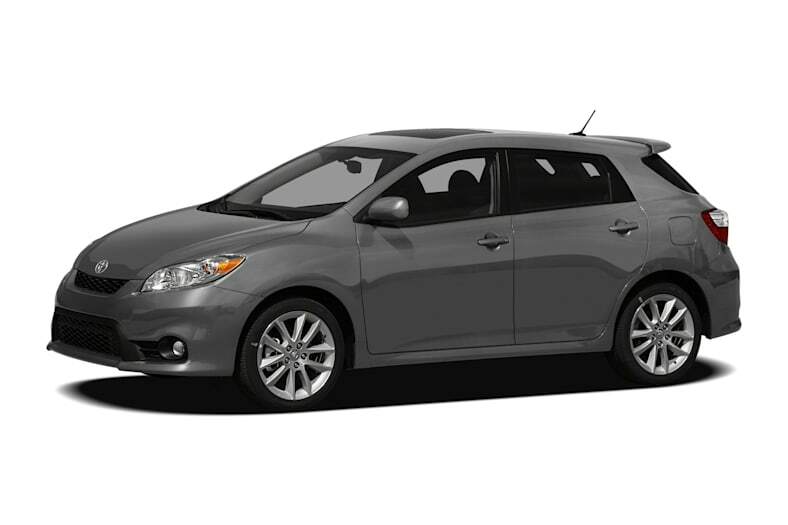 This second-generation Toyota Matrix was launched as a 2009 model. For 2011, Matrix was freshened with new wheels and minor changes to interior trim and a Smart Stop Technology brake-override system was added as standard equipoment. The 2012 Matrix carries over unchanged, though for 2012 Matrix includes free maintenance for two years or 25,000 miles. Matrix is available in two grades: base Matrix L and sporty Matrix S. Matrix L comes with a 1.8-liter engine, while the Matrix S gets a more powrful 2.4-liter engine. Front-wheel drive is standard and the Matrix S is available with all-wheel drive. Matrix L offers a choice of 5-speed manual or 4-speed automatic transmission. Matrix S comes with 5-speed manual or 5-speed automatic. Matrix S AWD comes with a 4-speed automatic. Fuel economy is an EPA-estimated 26/32 mpg for a Matrix L (1.8-liter) with manual gearbox, 21/29 mpg for a Matrix S (2.4-liter) with 5-speed automatic. All models run on Regular unleaded gasoline. We recommend the 1.8-liter Matrix L with manual gearbox as the best model. We found the base Matrix 1.8 with 5-speed manual more fun to drive than a 2.4-liter Matrix S with an automatic. The 1.8-liter engine isn't as powerful, of course, but it revs more freely and is more of a driver's engine. However, if choosing an automatic transmission, we think the 2.4-liter engine with 5-speed automatic is the best choice. Matrix S AWD is best for the Snow Belt with its all-wheel drive. Check out the Matrix if you want the reliable reputation of the Corolla with less visual boredom, if you need a urban runabout that's cheap to buy and run, or just because it's logically all you really need for bumping around in heavy traffic. The Matrix doesn't stand out anywhere as much as it provides a useful, better than average package for any purpose short of pickup-sized building materials or a trip to the red carpet. By price and hatchback design, Matrix competes with roomy compact cars such as the Honda Fit, Nissan Versa, Subaru Impreza, and Volkswagen Golf. It's also an alternative to small vans and crossovers.